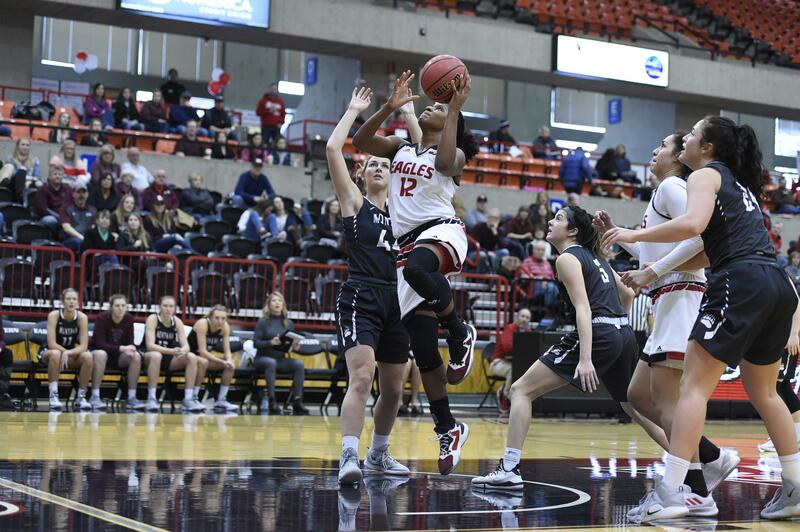 Violet Kapri Morrow totaled 25 points and seven rebounds, and Eastern Washington’s women rallied from an early deficit to beat Montana 67-64 Saturday at Reese Court. Jess McDowell-White added 11 points and four assists for the Eagles (6-15, 5-7 Big Sky Conference), who fell behind 13-0 to start the game. Morrow sank the winning layup with 39 seconds left before Alyssa Sealby pushed the lead to three with a pair of free throws with 6 seconds remaining. Montana missed a shot to tie on the final play. Gabi Harrington led the Grizzlies (10-11, 5-7) with 17 points and nine rebounds. Washington State 90, Arizona 88: Borislava Hristova scored 37 points, Chanelle Molina added 28 and blocked a potential winning shot at the buzzer and the Cougars (8-16, 3-10 Pac-12 Conference) ended a seven-game losing streak with a win over the Wildcats (15-8, 5-7) in Pullman. Molina opened the fourth quarter with a layup and Hristova followed with a fast-break bucket and Washington State had the big lead of the game at 69-58. The Wildcats answered with a 10-2 run and the game remained tight to the end. Aari McDonald scored nine of her 26 points in the final 2 minutes, but Molina got a hand on her shot at the end to give the Cougars the win. Idaho 90, Montana State 65: Mikayla Ferenz scored 32 points and the Vandals (13-8, 10-2 Big Sky) set a school record for 3-pointers in a game en route to a win over the Bobcats (12-11, 7-6) in Moscow. Taylor Pierce added 24 points on eight 3-pointers, as Idaho sank 19 triples and earned its sixth straight win. Tori Martell, Oliana Squires and Madeline Smith scored 13 points apiece to pace Montana State. George Fox 84, Whitworth 62: Tavin Headings posted 24 points as the Bruins (20-3, 13-1 Northwest Conference) defeated the Pirates (11-12, 6-8) at the Whitworth Fieldhouse. Emily Spencer added 12 points and Emily Holder and Haley Strowbridge scored 10 points apiece for George Fox, which won its eighth consecutive game. Madison Moffat led Whitworth with 15 points and six assists. Alli Kieckbusch contributed 12 points on 5-of-5 shooting and Madison Abbott scored 11. Treasure Valley 83, CC Spokane 79: Paige Vorwaller tallied 19 points in the Chukars’ (12-12, 5-7) victory over the Sasquatch (16-8, 5-7) at Spokane Falls CC. Macy Markus and Lillie Smith added 15 points each for TVCC. Koyama Young led CCS with 26 points and 11 rebounds. Shania Graham totaled 15 points and five assists, while Marissa Blair also scored 15. CC Spokane 96, Treasure Valley 92: Garrett White tallied 24 points, Dedrick Pakootas scored 23 while making five 3-pointers, and the Sasquatch (17-8, 8-4 NWAC) held off the Chukars (9-13, 7-5) at SFCC. Anthony Parker notched 14 points and five assists for the Sasquatch. Tanner McCliment-Call also scored 14. Jaden Vaughn scored 25 points, and Kaleo Pogue recorded 21 points and 10 rebounds for the Chukars. North Idaho’s men’s and women’s games at Walla Walla were postponed due to weather. A makeup date has not been announced. Published: Feb. 9, 2019, 8:51 p.m. Updated: Feb. 20, 2019, 9:12 a.m.